I subscribe to a fair number of print magazines, but I've noticed recently that there are very few of them that I'll open immediately on arrival and go on to read most of the contents. 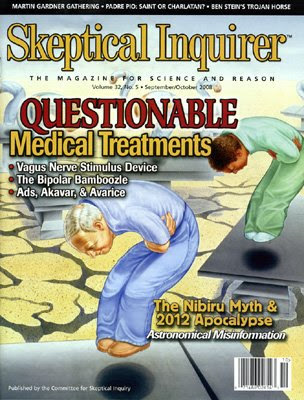 One such is Skeptical Inquirer - The Magazine For Science And Reason. The September/October 2008 issue is packed with interest. Much of it is necessarily US-centric, but I've yet to come across an equivalent UK periodical that offers comparably comprehensive examination of pseudoscience, quackery and fakery, as well as coverage of the relevant larger matters of social and political concern. Issues are usually themed - this one, as the cover opposite shows, is concerned with questionable medical treatments. 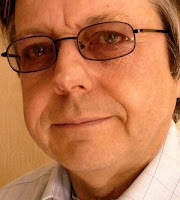 We have a history of the Vagus Nerve Stimulation device and its manufacturer's attempts to get it approved for use in cases of serious depression; the prescribing of inappropriate (but expensive) drugs for the treatment of bipolar disorder, as well as coverage of the widening of the disorder's definition; and the use of misleading or downright false advertising for a weight-loss product. There are articles on the Nibiru conspiracy theory, ghostly apparitions at lighthouses, searching for will o' the wisps, and much other fascinating stuff, including book reviews and a generous section for letters to the editor. It's all highly readable, from short pieces for consumption during a break, to longer articles requiring more concentrated immersion. The magazine is presented in a solid, professional manner that inspires confidence, but you don't have to rely on any kind of gut-feeling about its veracity - those articles dealing with verifiable facts always have notes and references to enable you to check up on them. Yes, I like it. If only we had something equivalent in Britain.